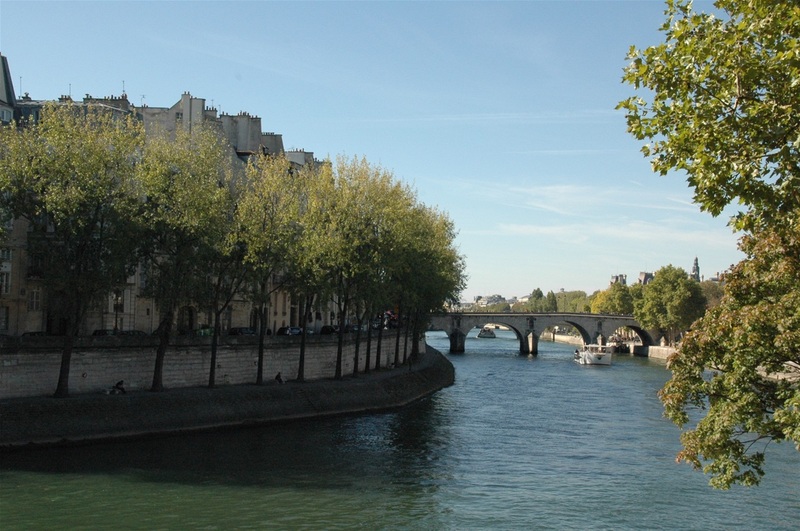 let’s first have a glimpse of the Ile Saint-Louis from the right bank, on quai des Célestins. 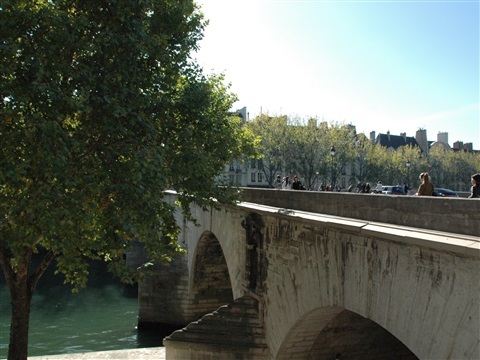 Then we will walk up to Sully bridge, from which we will enjoy a nice view of Paris and the island. We can take some time to have a look over the small public garden Barye, shunted aside by the traffic on the bridge. 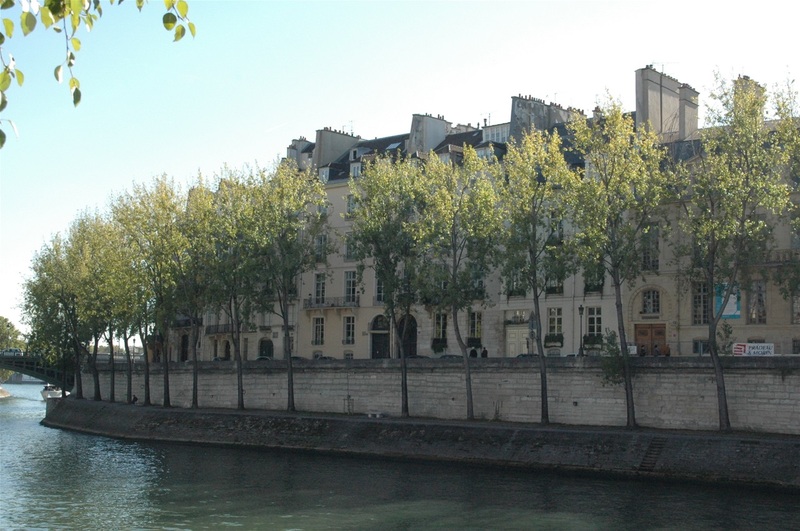 We will walk around the island, starting quai d’Anjou where will discover the historic mansions : hôtels Lambert and de Lauzun. We will walk a little further on quai de Bourbon, d’Orléans and Béthune. We will discover some streets and the main street : rue Saint-Louis-en-l’île, where we can see the church. The view is taken from the right bank, quai des Célestins. The elegant facades of the private mansion houses can be distinguished behind the poplar trees. The island was built late between 1614 and 1643. Before that, it was just a couple of small uninhabited islands. lL'île aux Vaches - the Cows Island - because it was just used as a pasture; and l'île Notre-Dame as it was part of the cathedral area. Its late urban development - merging the two islands together, paving the streets following a regular checkerboard pattern, building bridges and magnificent private mansion houses - has provided this district with a unique architecture harmony. 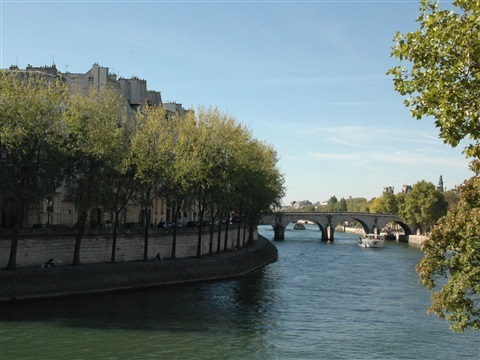 From Quai des Célestins, we can admire l'île Saint Louis and Marie's bridge, built in 1614 and achieved in 1630. Its name Marie is neither a tribute to King Louis XIII's mother - Marie de Médicis - nor in relation with the near cathedral Notre Dame de Paris. 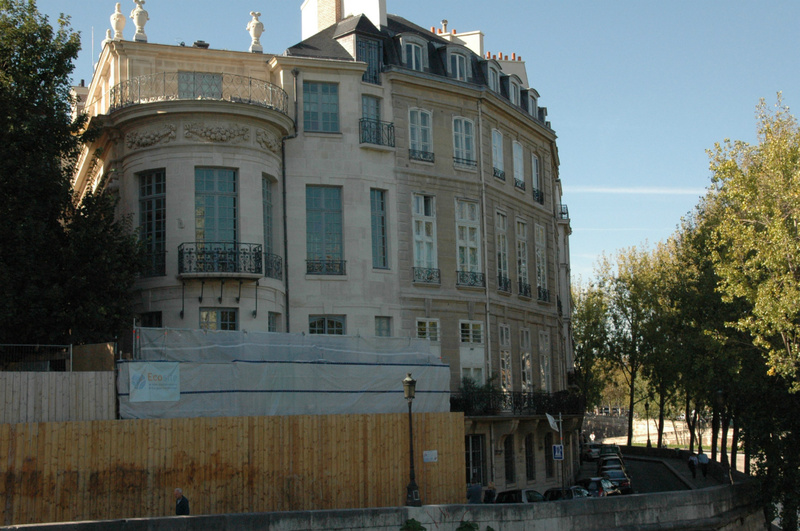 Its name is a tribute to its builder, Christophe Marie who designed the entire building of Ile Saint Louis. 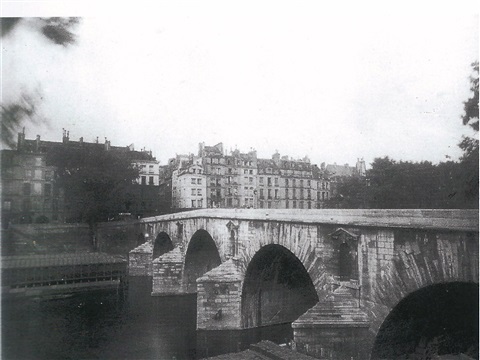 This stone bridge, inaugurated by King Louis XIII, still a nine year old child, is the second oldest Parisian bridge (the oldest is Pont-Neuf). Generally, bridges in that time were occupied by narrow houses with a small shop. On Maries's bridge fifty uniform houses were occupied by various craftspeople. In 1658, twenty houses collapsed together with two arches destroyed by a violent flood. 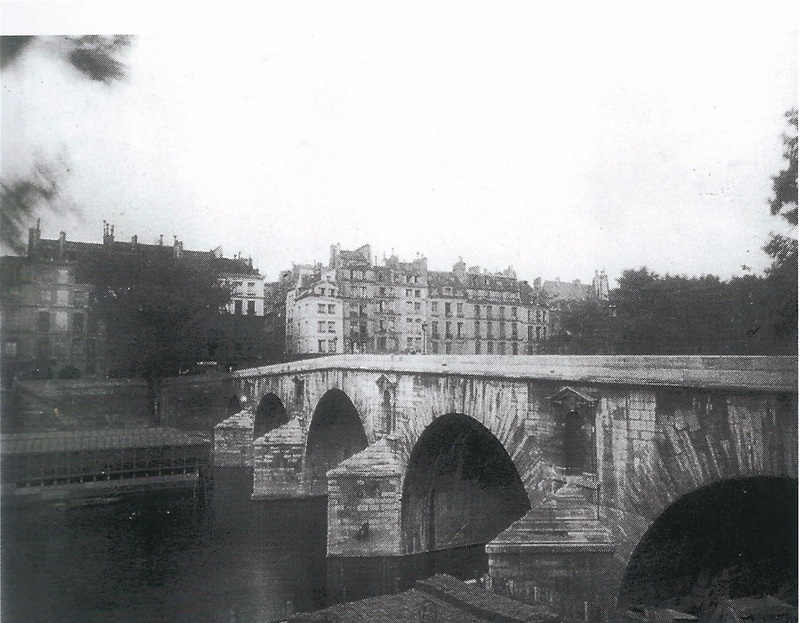 From Quai des Célestins, we have now reached the Sully bridge from which the picture is taken. 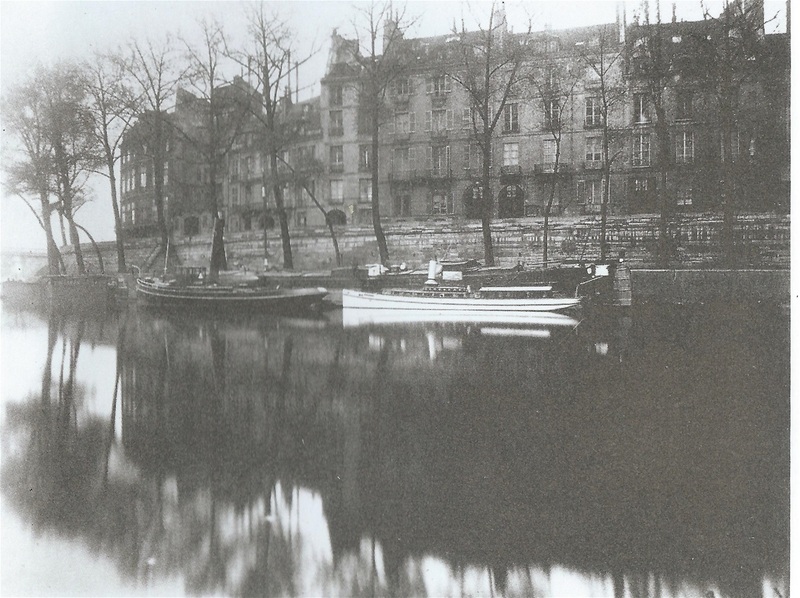 Let's admire the way Atget captured the metallic shimmer of the Seine. 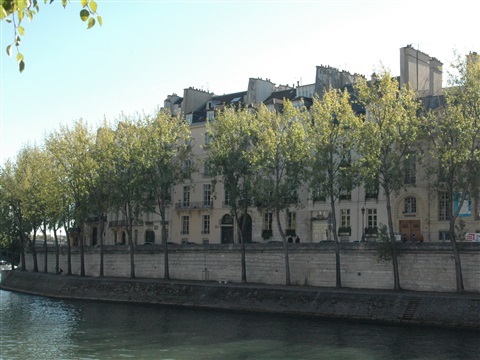 Together with the poplar trees which hide the island, the Seine looks like a green ribbon wrapping a jewel box. The "treasure island" can be reached by five bridges : on its East side by Sully bridge where we are. On its West side by Saint-Louis bridge if you come from Ile de la Cité. By Louis-Philippe and Marie's bridges if you come from the Right bank. By Tournelle bridge if you come from the Left Bank. We arrive on quai d’Anjou from Sully bridge. This quay is exposed to the North and therefore always a little bit chilly. But we will be quite rewarded because the most beautiful private mansion houses - hôtel Lambert and hôtel Lauzun - are located on this side. But before, let's have a look over the small isolated Barye public garden, on the other side of the bridge. The bridge built in 1876 is cutting the eastern end of the island, where in the past there was the most magnificent private mansion house of the île Saint-Louis, the hotel Bretonvilliers, which had a huge terrace overlooking the river. 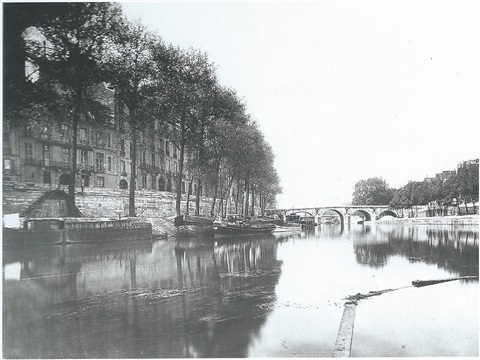 The hotel was destroyed when the Sully bridge was built. Among the private mansion houses built in that time, hotel Lambert was one of the finest. It was built in 1644 for a rich man, Jean-Baptiste Lambert, minister of Finance under King Louis XIII. The greatest artists of that time, the architect Le Vau and the interior designers Le Sueur and Lebrun were called upon its construction. Extensive rehabilitation work undertaken by its last owner, the emir’s brother of Qatar were discussed at length in our local newspapers, but emotion in this debate really peaked when a fire in July 2013 seriously damaged a part of the mansion, especially the cabinet des Bains designed by Eustache Le Sueur. It has been said that this room was Voltaire’s private apartment when his mistress, the marquise du Châtelet bought the hotel.